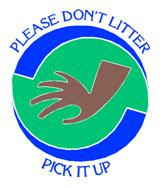 (DEQ) - The Division of Environmental Quality (DEQ) Cleanup Brigade will be at it again picking up trash at Makaka Beach this Saturday, July 6, 2013 at 8 am. If you would like to volunteer your time to clean and beautify our island, please meet the DEQ representatives on Saturday at the Makaka Beach parking lot at 8 am. Volunteers will split into groups and clean until 10:00 am and break for drinks and then continue, if needed. This month, outstanding brigade volunteers who participated in at least ten (10) monthly cleanups will receive a brigade cap and those who participated in at least three (3) cleanups will receive a brigade t-shirt. Last month’s Obyan Beach Cleanup was successful with 21 volunteers participating. Thanks to, students from GTC Elementary, CK Head Start, Hopwood Jr. High, Saipan Southern High, staff from PSS, CJDA, and other volunteers, about 300 pounds of trash was removed from the beach and properly disposed of. The DEQ is looking forward to a repeat success this Saturday, so join DEQ’s monthly cleanup brigade and “Pick It Up!” Let us work together for the health of our coral reefs and cleanliness of our beaches for everyone to enjoy. For more information about volunteering, please contact the DEQ office at 664-8500/1.